You know that you're going to love your pup for all time, no matter what, no matter how long. In fact, sometimes, you feel that you've always loved that pupper, maybe even back before you even had the adorable little critter. If that is describing the kind of relationship that you've got with your little furbaby, you might have one of the rare pets that may have been a reincarnation of the original pups of the prehistoric world! You might not know it, but the triceratops was astoundingly cuddly despite all the horns and leathery hide! Channel the late Cretaceous period when you let your pooch go roaming on the hunt for treats in this Dog Dino Pup Costume. This is a soft front coat that has the look of tough hide. Get ready for some adorable charges that are thankfully just cuddly thanks to the hood that features a wide fan and three soft horns just like your favorite herbivore. You know that your little pupper could eat a dinosaur's weight in treats, so why not let their appearance reflect their growling tummy. 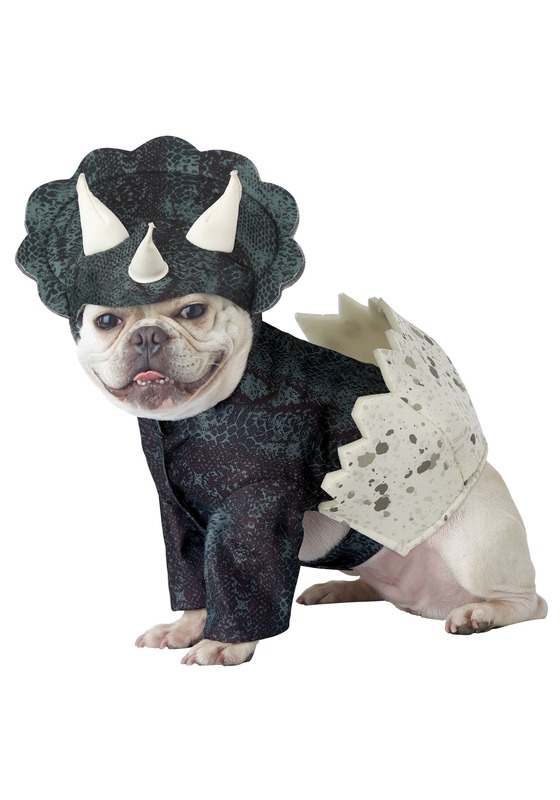 At least with a plant-eating triceratops costume, your pup might get a few more green beans in their diet.